We are one of the largest integrated care providers in England. Our 8,000 staff serve a population of around 650,000 people. 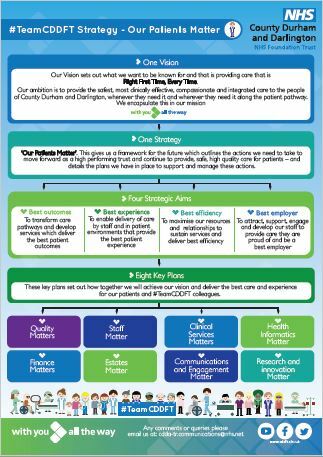 Welcome to County Durham and Darlington NHS Foundation Trust. We are one of the largest integrated organisations in the country, providing hospital and community services to a population of over 650,000. We are an ambitious and innovative organisation with a talented workforce of over 8,000 colleagues. We provide hospital services from two acute sites - Darlington Memorial Hospital and University Hospital of North Durham. We have a centre for planned care in Bishop Auckland and provide care from community hospitals in Chester-le-Street, Shotley Bridge, Barnard Castle, Sedgefield and Weardale as well as over 80 other community based settings and in patients' homes. Staff Matter - our people strategy: CLICK HERE to access the strategy document.